With a growing trend for prizes and plushes in the industry, BANDAI NAMCO Amusement Europe Ltd displayed a large range of its coveted prizes and plushes at the IAAPA Attractions Expo 2018. This included many game/prize crossovers and new film character tie-ins like PAC-MAN, DC Comics and Halo. "We showed everything from PAC-MAN in extended plus and prize ranges, through to the new Minecraft movie range," said Darrell Simmonds EMEA Sales Manager. "The DC Comics, PAC-MAN and Halo branded merchandise are especially effective when combined with the games and customers could really see the potential." Along with its top-rated and high-earning Halo: Fireteam Raven machine, BANDAI NAMCO displayed a range of gifts and plushes featuring the brand. 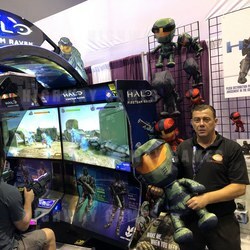 Merchandise included plushes, mugs, stein glasses, baseball caps, watches and stress balls, and they received significant orders for the Halo-branded merchandise at the event. For its PAC-MAN range, BANDAI NAMCO displayed gifts including inflatable balls, 3D PAC-MAN plushes and a new shiny version of PAC-MAN & the Ghosts, which can also be combined with an array of BANDAI NAMCO games to boost revenue.